Wondering if it's time to start considering false teeth? If you're already missing several teeth, you struggle with eating certain foods due to the condition of your teeth, or you feel insecure about the way your teeth look, then dentures could be a good option. Having the false teeth fitted makes it easier to eat, eliminates tooth pain, and means that taking care of your mouth is easier. Dentures are often recommended to the elderly, but they're suitable for people in all stages of life, so don't feel like you're not old enough for them. If you suffer from any of the problems below, ask your dentist about dentures. If you're missing teeth as a result of decay, disease or an accident, then you might already be thinking about dentures. Partial dentures can be used to replace some of your teeth while the others remain intact, while full dentures will replace all of your teeth. Having partial dentures fitted is a good option if your missing teeth are close to the front of your mouth and affect the appearance of your smile. They can also make eating easier, with no gaps to worry about. 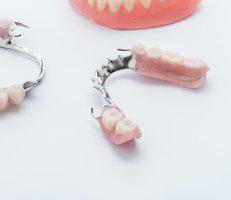 Partial dentures are commonly fitted after accidents in young patients. Full dentures are recommended when you're missing quite a few teeth, and have problems with your remaining teeth. For example, if your remaining teeth are badly decayed or you're suffering from gum disease, then it may be best to have them removed and replaced all at once. Full dentures are often recommended for the elderly, and can have a massive impact on the range of foods that you're able to eat. You don't need to have missing teeth to struggle with eating. Problems like gum disease, tooth erosion and enamel damage can all make eating painful and difficult. If you find yourself avoiding foods which are hard or chewy, and sticking instead to soft foods like soup or stew, then dentures are a good option to consider. Your false teeth won't cause any pain when eating, and are made from strong acrylic, meaning you can enjoy all the foods you used to - chewy sweets, crunchy apples, and many more. Missing or damaged teeth don't just pose health risks, they can also seriously damage your self-esteem. If you're really insecure or unhappy with appearance of your teeth, then full or partial dentures could help you get your confidence back. 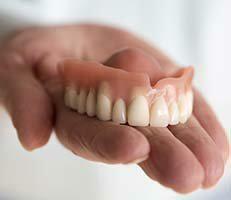 Dentures are designed to look exactly like your real teeth, so nobody will be able to tell the difference. Dentures are a drastic option, though, so make sure you've considered all the alternatives first. If you're suffering from any of the dental problems above, ask your dentist about dentures. False teeth can improve your oral health, boost your self-confidence, and help you to enjoy a full range of foods.